Former Vice President Al Gore and the U.N.'s Intergovernmental Panel on Climate Change won the 2007 Nobel Peace Prize Friday for their efforts to spread awareness of man-made climate change and lay the foundations for counteracting it. "I am deeply honored to receive the Nobel Peace Prize," Gore said. "We face a true planetary emergency. The climate crisis is not a political issue, it is a moral and spiritual challenge to all of humanity." Gore's film "An Inconvenient Truth," a documentary on global warming, won an Academy Award this year and he had been widely expected to win the prize. Deputy Press Secretary Tony Fratto offered the first White House reaction to news. Fratto told CBS News, "Of course we're happy for Vice President Gore and the IPCC for receiving this recognition." Gore said he would donate his share of the $1.5 million that accompanies the prize to the Alliance for Climate Protection, a bipartisan nonprofit organization devoted to conveying the urgency of solving the climate crisis. After speculation yesterday that he was headed overseas, Gore cancelled or delayed a trip to China to stay in San Francisco and speak at a fundraiser for Sen. Barbara Boxer, D-Calif., reports CBS News correspondent John Blackstone. "His strong commitment, reflected in political activity, lectures, films and books, has strengthened the struggle against climate change," the Nobel citation said. "He is probably the single individual who has done most to create greater worldwide understanding of the measures that need to be adopted." Even before Gore's Nobel prize was announced, speculation began over whether a Nobel medal might cause Gore to consider becoming a candidate for president. "Winning a Nobel Peace Prize is a life changing event," Dylan Malone, who runs a Web site called AlGore.org, which advocates a Gore presidential run, told CBSNews.com's Brian Monotopoli. "He's done the slideshow, made the movie, won every accolade that our society has to give. There's nowhere else to go to take it to the next level in my mind." "I think the inconvenient truth for Al Gore president dreamers is he doesn't really want to run and a lot of Democrats think that's a wise decision," said Jim VandeHei, executive editor of Politico.com, on CBS News' The Early Show. "Al Gore does not have that fire in the belly that you need to mount a national campaign... But more importantly, Democrats seem satisfied with the candidates that they have right now." "Eight years of the Clinton presidency - and one bitter campaign in 2000 - have left the two power couples estranged and, perhaps, resentful," writes CBSNews.com senior political editor Vaughn Ververs. "Another eight years later, Hillary Clinton is riding high in her bid to win the Democratic nomination and Al Gore is an international superstar. Now the question is, will Al run?" Peace Prize committee chairman Ole Danbolt Mjoes said a possible Gore presidential run was not his concern. "I want this prize to have everyone ... every human being, asking what they should do," Mjoes said. "What he (Gore) decides to do from here is his personal decision." However, when asked about the 2008 U.S. elections, he said: "I am very much in support for all who support changes." The last American to win the prize or share it was former President Carter in 2002. The Nobel committee cited the Panel on Climate Change for two decades of scientific reports that have "created an ever-broader informed consensus about the connection between human activities and global warming." Members of the panel, a network of 2,000 scientists, were surprised that it was chosen to share the honor with Gore, a spokeswoman said. "We would have been happy even if he had received it alone because it is a recognition of the importance of this issue," spokeswoman Carola Traverso Saibante said. The panel forecast this year that all regions of the world will be affected by climate warming and that a third of the Earth's species will vanish if global temperatures continue to rise until they are 3.6 degrees above the average temperature in the 1980s and '90s. "Decisive action in the next decade can still avoid some of the most catastrophic scenarios the IPCC has forecast," said Yvo de Boer, the U.N.'s top climate official. He urged consensus among the United States and other countries on attacking the problem. Climate change has moved high on the international agenda this year. The U.N. climate panel has been releasing reports, talks on a replacement for the 1997 Kyoto Protocol on climate are set to resume and on Europe's northern fringe, where the awards committee works, there is growing concern about the melting Arctic. Jan Egeland, a Norwegian peace mediator and former U.N. undersecretary for humanitarian affairs, also called climate change more than an environmental issue. The committee often uses the coveted prize to cast the global spotlight on a relatively little-known person or cause. Since Gore already has a high profile some had doubted that the committee would bestow the prize on him "because he does not need it." 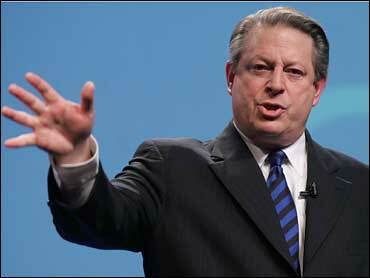 Gore's climate change effort has had its share of criticism. A British judge said in a ruling published Wednesday that some assertions in his documentary were not supported by scientific evidence. The case involved a challenge from a school official who did not want the film shown to students. The ruling detailed High Court Judge Michael Burton's decision this month to allow screenings of the film in English secondary schools. The judge said that written guidance to teachers, designed to ensure Gore's views are not presented uncritically, must accompany the screenings. In recent years, the Nobel committee has broadened the interpretation of peacemaking and disarmament efforts outlined by Swedish industrialist Alfred Nobel in creating the prize with his 1895 will. The prize now often also recognizes human rights, democracy, elimination of poverty, sharing resources and the environment. Two of the past three prizes have been untraditional, with the 2004 award to Kenya environmentalist Wangari Maathai and last year's award to Bangladeshi economist Muhammad Yunus and his Grameen Bank, which makes to micro-loans to the country's poor. The prize also includes a gold medal and a diploma. The prize for economics will be announced Monday.